why is american idol on all the time? i mean, because it's on constantly and i never know when i'm always freaking out and rushing to change the chanel. it's a cruel joke fox is playing on me. i do love television, though. 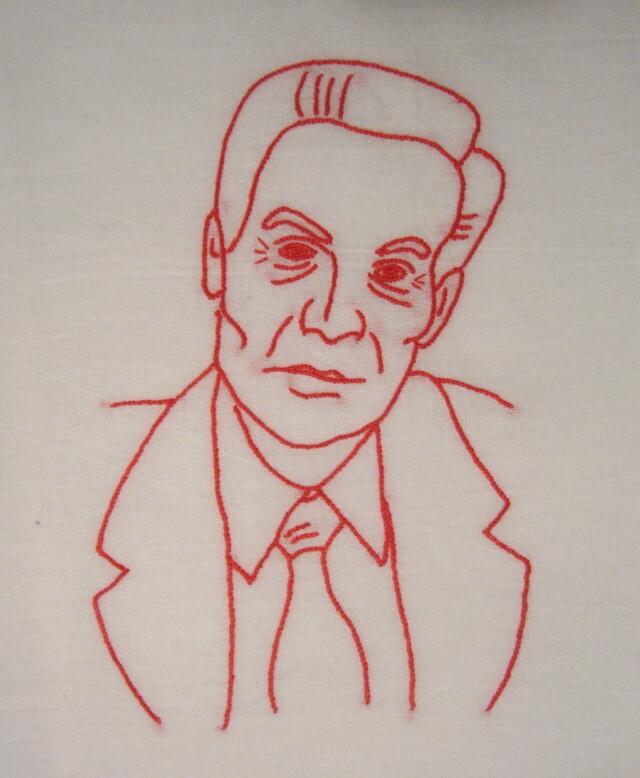 i made another lenny towel, and am hoping to work on a law & order series of tea towels. the first lenny i made right after jerry orbach died, and it took forever because i was sort of sad about the whole thing. this one was easier to work on. next up, detective logan. or tutuola. maybe benson or stabler...so many choices! i could work on this series forever. i'm selling most of my stuff over at 20 Twenty right now, so you should head over there. joel just moved into a new space in ballard, and i hear it's lovely. let me know if you go by there, i'm super curious about it. it makes me miss seattle even more to not be able to just pop over and check it out. get more email from me! You can now buy pinprick baby gear at an honest-to-goodness store! 20 Twenty is a vintage men's, women's and children's shop in dowtown Ballard, WA (across the street from the tractor tavern). Along with carrying a variety of vintage clothes for everyone in the family, they also carry vintage and new accessories, jewelry and art by local artists. If you're in seattle, you should check it out. This is a Flickr badge showing public photos from pinprick. Make your own badge here. last day for custom orders! sassy baby stuff is great; colorful and not super expensive, useful and babies love them. yes, more pricey items, but i like how comprehensive this website is. they have lots of lovely things. yes, it can be a bit pricey, but the clothes are so sweet. i've also had a chance to purchase some, and they are also ridiculously soft. babies look cute in these, plus they're light and easy to move. they are also supposed to be more womb-like and be good for getting baby to sleep. --(( Sidecar Slings ))-- Baby Slings for mamas on the go. they use very cool fabrics for slings that are not too hippy. Beekeeper Cartoon Amusements: Comix by Jason Little. kozyndan.com version1 --- give us good things!!!! you know you want to buy me!